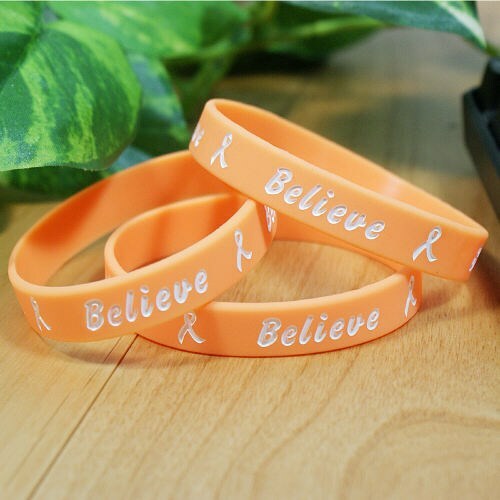 Show your passion for MS and/or leukemia awareness with our Orange Silicone Believe Bracelet. Proudly wear your bracelet so everyone knows you support your Awareness. Each Orange Bracelet arrives with the saying: Believe in white. Multiple Sclerosis Bracelets are a perfect addition to any team walking in an Awareness event. The bracelets are for our Walk MS Team, very pleased with color & price! The bracelets were just what we wanted to wear & will be ordering more! I was very reasonable.I will order more. The bracelets were perfect & just what we wanted for our Walk MS.
Additional Info We offer many Personalized Orange Awareness Apparel and Gifts so that you may show your support each day. Give our Gifts to a loved one or use our Awareness Keepsakes for any Special Charity Events or Awareness Walks you are involved in. For more Orange Awareness Gifts, view our collection of Multiple Sclerosis Awareness Gifts and our Leukemia Awareness Gifts.